SSAC’s purpose is to study, map and monitor ideas of addiction, seeking to illuminate the ways the ‘problem of addiction’ itself is constituted and operationalised in Australian society, culture and politics. Twitter is a significant new site of public discourse. It’s accessed by large numbers of people who are both producers and consumers of the information it circulates. Emerging as a major means of communicating on addiction, Twitter sees at least a few thousand addiction-related messages posted each day. These messages both reflect and participate in what we call the ‘addicting’ of contemporary Western societies, where substances, persons, brains and activities are all being brought into, or reinscribed by, shifting notions of addiction. So we think it’s important to examine how Twitter may be helping frame addiction for so many people. It’s also worth asking whether Twitter’s particular social and textual relations and technological affordances might be remaking the culturally-charged concept of addiction. In one recently published article, Dwyer and Fraser look at the ways in which addiction is being made on Twitter. They also consider how the technological ‘affordances’ of Twitter – its networking capabilities and 140-character limits for messages – help constitute the kinds of addiction being materialised. Dwyer and Fraser find a multiplicity of meanings in the short Twitter messages, but they also find a clear illustration of the processes of ‘addicting’. Within the Twitter posts, all aspects of everyday life, and seemingly limitless persons and practices, are framed as, and subjected to, the logic of addiction. Importantly, however, they find a pattern: addiction enacted as equally characterised by misery and pleasure, desperation and triviality. Within this rather polarising discussion, commonalities also remain. Familiar normative notions of legitimate subjectivity, proper relations between selves and objects, and the determining power of material objects and activities re-emerge over and over in the posts. Dwyer and Fraser argue that Twitter’s character limit reinforces reliance on cultural clichés, metaphors and other kinds of shorthand: reproducing and confirming conventional stable, unified addiction disease objects. Despite Twitter’s putative capacity to democratise public expression and discussion, Dwyer and Fraser find that it tends to reinstate the authority of scientific knowledge, and fails to challenge or alleviate addiction-related stigma. In another article (currently under review), Dwyer and Fraser take a close look at celebrity tweets on addiction, examining how specific addiction problems, and their solutions, are being constituted through the tweeting practices of celebrities. Their analysis focuses on messages posted by two celebrities who publicly self-identify as ‘addicts’: the American singer, Demi Lovato, and the British comedian, Russell Brand. Dwyer and Fraser find that the Twitter activity of these two widely followed celebrities re-enacts familiar tropes and clichés of addiction, collapsing drug use with harm and addiction, and addiction with pathology and death. Abstinence is posed as the only genuine and effective response, and the contradictions in simultaneously individualising action against addiction and condemning stigmatisation are ignored. Dwyer and Fraser argue that the oversimplification enacted in celebrity tweets is directly afforded by Twitter’s character limit and the constraints it places on conversation. Their analysis troubles the popular assumption that tweets constitute a conversation and that Twitter helps flatten power. Twitter influence is at least partly an effect of recognisability and prior authority (such as celebrity). While Twitter has the capacity to afford the circulation of novel concepts, this does not mean those seeking to do so begin on an equal footing with those seeking to circulate familiar, already palatable, concepts. 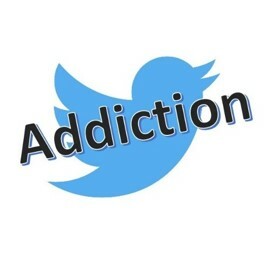 What this means for addiction, at least, is that despite the ‘revolutionary’ potential of Twitter posited by advocates and some scholars, the global, uncensored communication on Twitter serves largely to validate and perpetuate dominant addiction concepts and the stigma and discrimination these concepts evoke.